This review may appear a bit contradictory when compared to reviews of similar bag designs. In essence, it has no design. It is bland and lacks character. However, each different flavor color coded bag features a bright contrast between the main body of color and the silver waves. The brand name pops and the Chips float nicely in the centre. As it is such a striking effect it actually overcomes many of its design flaws. These Chips were very crispy, but not particularly crunchy. There was a consistent audible munch, but there was nothing brittle or snappy about it. The mush stage emerged far too quickly. These thickly cut Chips featured very thinly separated Ridges. There was the odd dark fleck spattered here and there on otherwise fairly basic yellow Chips. There were a few more broken Chips in the bag than we would hope for, but that is fairly common with Rippled Chips. A Nose Plunge Test revealed a sort of odd salami aroma. 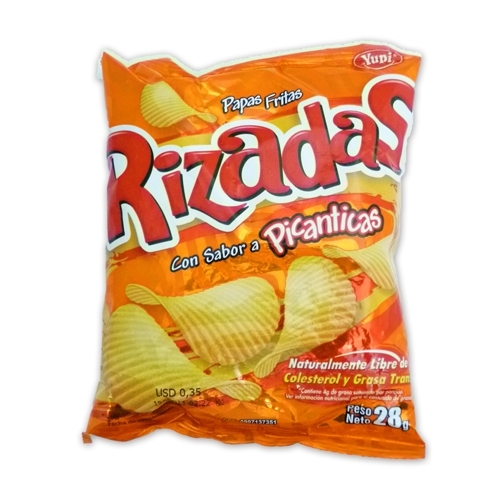 The flavor was a little salty, somewhat potatoey, and there was a dose of spice, but it was so mild that it could be fairly described as Chips with a light coating of Picanticas. They were also very high in saturated fat.